Let me admit up front that I’m not the best person to be covering a robotics competition. In fact this is only the second one I’ve attended; the first, Sparkfun’s AVC, is a tough act to follow and set my expectations pretty high. On the other hand, the theme of this year’s International Robot Olympiad is Robots in Agriculture, which is right in line with my own interests, so maybe it’s a wash in this instance. Autonomous forklifts to move trays of plants. Another observation has to do with the nature of the competition, which, unless I’ve completely misunderstood what I was seeing (possible), seems to include assembling working robots from a box of parts and programming them within a limited amount of time. Not every event is of this nature, but the similar appearance of robots entered within each of several events suggests that some of them are, or else there are very strict design guidelines. Perhaps both, and perhaps I’ll manage to get this sorted out by the time IRO 2013 is over on Thursday. This year’s theme, Robots in Agriculture, only figured in a handful of events, but in my opinion the most interesting of them. What was on display outside the exhibition hall this afternoon had clearly not been hurriedly assembled from a box of parts. 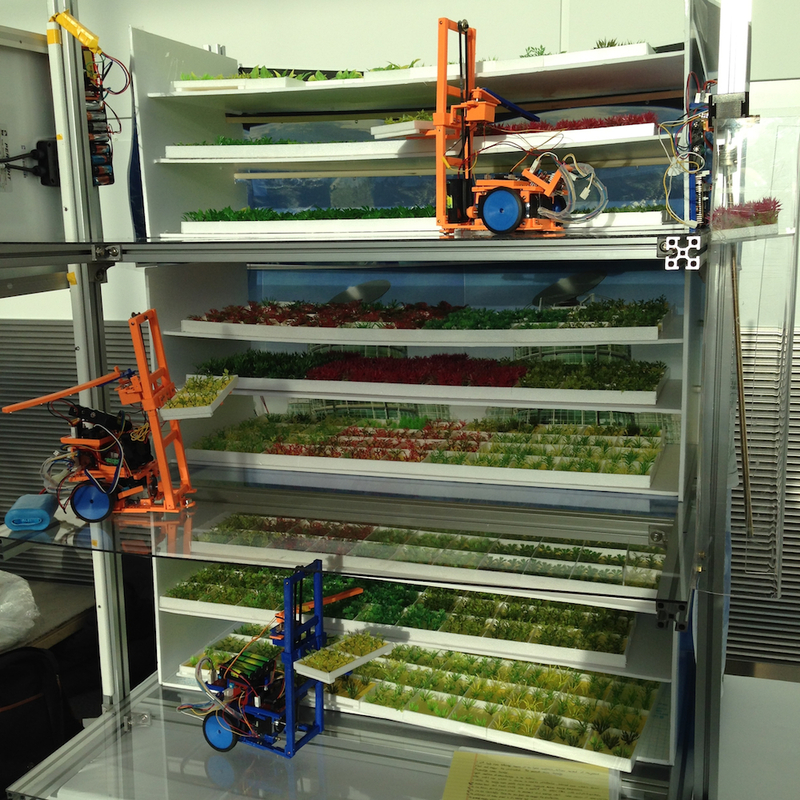 The photo above shows a model of a multilevel indoor plant production facility with autonomous forklifts to move trays of plants about. Such a facility might prove very useful in urban areas not well served by nearby market gardening operations, so-called “food deserts” within which produce is either expensive or of low quality. Two young men with their automatic rice paddy irrigation system. 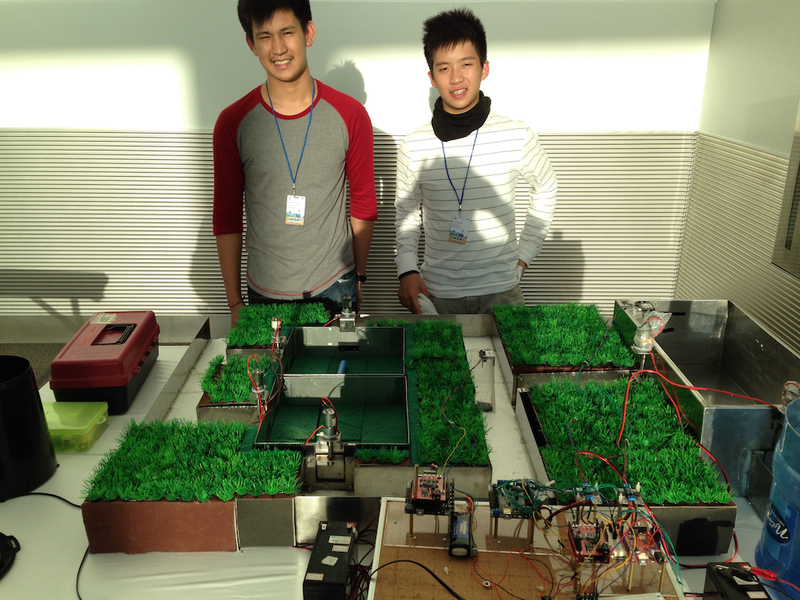 Sean and John, from the Philippines, are shown here standing behind their prototype of an automated irrigation control system for rice paddies, with water level sensors to be placed in the fields and water flow controlled by gates, which are operated by the output from the controller board. Such a system could free farmers from the time-consuming task of manually operating the gates controlling flow to maintain proper water depth. 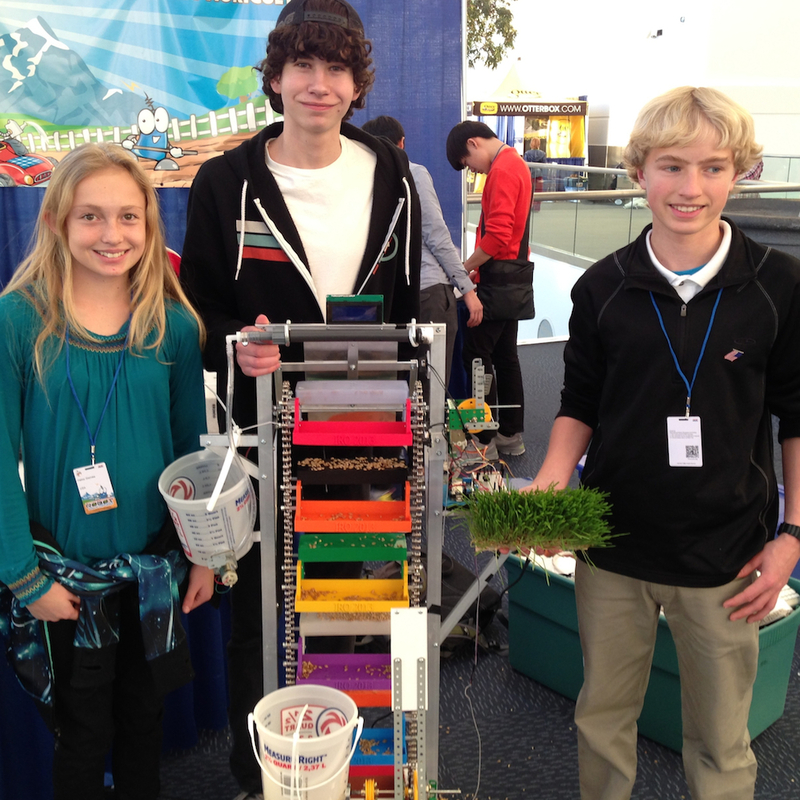 Three Denver-area residents with their seed sprouting robot. Haley, Ryan, and Samuel are local to the Denver area. Here they are shown with their grain sprouting robot, the trays of which remain level while moving very slowly, suspended from a vertically arranged chain drive. They intend the sprouted grain for use in feeding livestock, believe the accumulation of sugars from photosynthesis adds food value to the grain, and are certain they can produce the sprouts using a fraction of the water that would be required to produce an equivalent amount of irrigated hay. Overall I’m very impressed with what I’ve seen. These young people give me hope that the future may turn out well.